Price: 50$, can talk about price. About the item: Fresh and new GUNZ Website design, including everything that need for successfull site, fresh design and modern. gunz websites are gray / old style, this design is FULL UNIQUE, NEW STYLE. Contact: Private messeage / Skype only. 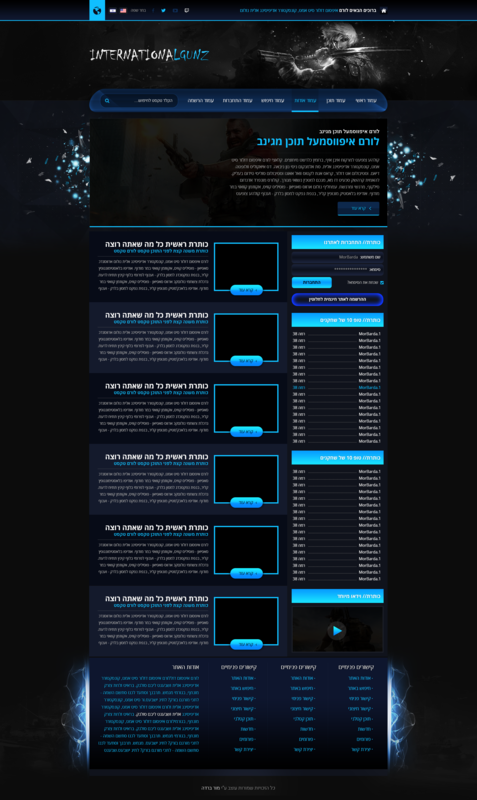 Im selling PSD Only, i can code the PSD to html css js (Bootstrap 100% responsive, including slider). It would be nice if we could install it. 우리가 그것을 설치할 수 있다면 좋을 것입니다. IF you have any website of gunz online that work (with register e.t.c) i can adapet this theme to the website that you will have / find. Web pages have additional costs How much more should you pay? Is the Korean language set? Web pages I guess no need because most of the websites use the Home page design and just replace the content (the center), it’s in hebrew at the PSD but if choose to pay extra for making html css I will make it English. *for other questions please send me Private Messeage because I done want spam the tread, I answered this questions because it’s may help others that want purchase and have questions.